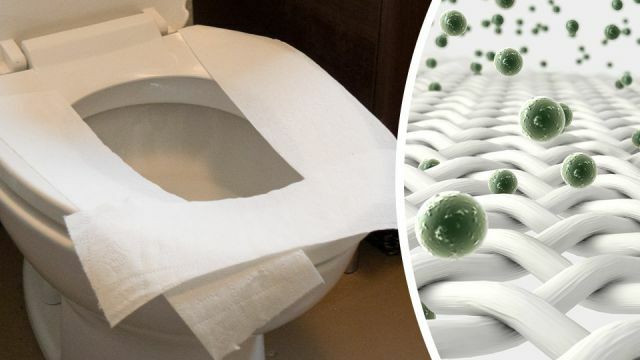 In fact, you might be exposing yourself to more germs by adding a layer of toilet paper to the seat than you would if you just sat your rear down on the seat with nothing between it and your skin. If that creeps you out, here’s what you really need to worry about in the restroom, and how to protect yourself. Public toilet seats are designed specifically to keep germs from hanging out on them. Non-porous plastic toilet seats are among the least germy surfaces in a public restroom. A study by BioCote, a company that produces antimicrobial materials using a silver-based antibacterial agent, found that bacteria hang out in unexpected places in public restrooms. The team found only 150 Colony Forming Units (CFU) of bacteria on the toilet seat. There were 220 CFUs on the toilet paper dispenser and a whopping 50,000 CFUs in the sink. Germs can’t multiply on bare, unbroken skin. So, if the back of your thigh brushes up against the toilet seat, the likelihood of catching anything is extremely low. The good news is most of us are perfectly safe using public restrooms. While things like streptococcus (strep), Staphylococcus (staph), E. coli, the common cold virus and other nasty bugs do hang out in public restrooms, if you have a healthy immune system and you wash your hands properly, you’ll be okay. According to the experts, sexually transmitted infections (STIs) aren’t a big concern either. Chlamydia and gonorrhea, for example, are not transmitted efficiently via a toilet seat. Most bacteria have a hard time surviving in an open-air environment anyway, and that goes for STIs and gut bacteria as well. While it’s unlikely that you’ll contract an STI or a flu bug from a toilet seat, it might be possible to contract a staph infection if you have an open wound. A small cut or an open pimple on your buttocks or leg could put you at risk of a staph or strep infection, but even that’s fairly unlikely. In most cases, the best way to use the toilet in a public restroom is to squat over the seat, if physically possible. While most public restrooms don’t have lids on their toilets, some do. When there’s a lid available, use it to avoid exposure to toilet plume while you’re in the stall. Assuming you immediately wash your hands after leaving the stall, you’ll wash away any germs you might pick up by shutting the lid before they can harm you. When you can avoid doing so, hang your purse, backpack, briefcase and other items on the door. The floors in restrooms are worse than the toilet seat, by 50 more CFUs. That makes them worse than toilet paper dispensers for harboring germs. According to the study conducted by BioCote, the largest amount of bacteria were found on handrails (360 CFUs), the tap itself (1,000 CFUs), the radiator vent (1,200 CFUs) and the sink itself, with 50,000 CFUs found. This means that proper handwashing — and using a paper towel to turn the faucet off — is a must. To protect yourself properly through handwashing, begin by wetting your hands and then using any soap, liquid, bar or powder to wash. Lather well by rubbing your hands together for at least 20 seconds. Be sure to scrub between your fingers, the backs of your hands, under your fingernails and up to your wrists. Rinse well and use either paper towels or an air dryer to dry your hands. If possible, use your elbow or a paper towel to turn the faucet off. With proper handwashing and a few good choices while in the restroom, there’s no need to fear public restrooms. Are you as surprised as we are to learn about the germs in public restrooms? Hey Buddy!, I found this information for you: "Stop Putting Toilet Paper On The Seat And Do This Instead". Here is the website link: https://www.thealternativedaily.com/stop-putting-toilet-paper-on-a-toilet-seat-and-do-this-instead/. Thank you.